Welcome to China, an oriental country with long and glorious history and full of modern dynamics. Upon your arrival in Shanghai, our guide is ready to meet you at the exit of the airport, holding a welcome board with your name on it. 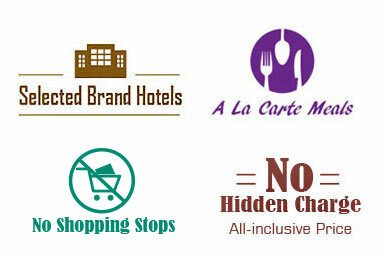 We then drive you to check in at the hotel and remain the rest time of the day free. The group you will join in is scheduled to begin and end in Shanghai. We have arranged the sightseeing of Shanghai when you come back on the eleventh day, so today you will take the high-speed train heading for Beijing first. The train journey is around 4.5 hours and it runs about every 20 minutes from 07:00 to 19:00. The ideal one we would like to book for you leaves at 10:00 and arrives in Beijing at 15:00, but if you have other preferred time of leaving, or if you prefer to take flight instead, come to your travel consultant please. 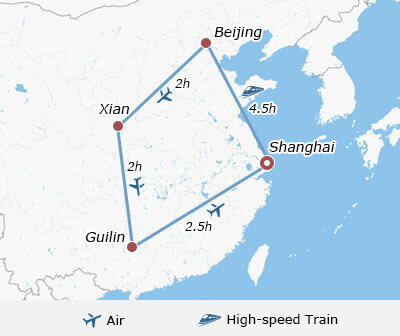 The transfers between your hotel and the train station in both Shanghai and Beijing are included. After we assist you to check in at the hotel in Beijing, you will be free for the rest time of the day. Take a good sleep tonight and your exciting China group tours from Shanghai officially starts from tomorrow. In the morning, meet your guide and the other group members at the hotel lobby. Let's go for our first highlight of this trip, Tiananmen Square and the Forbidden City. Covering an area of 440 thousand square meters, Tiananmen Square is regarded as the heart of the city. After taking some pictures on the square, we walk into the Forbidden City, a grand Royal Palace for Ming and Qing dynasties. Besides the large scale and unique wooden structure of this ancient architectural complex, the more interesting part of this would be the historical and mysterious stories and legends about the imperial life that you will hear from your guide. After that, have an a la carte lunch (valued at CNY150.00 per person and included in our price) at a decent local restaurant to taste the real Chinese food including the roasted Peking Duck. The afternoon time is to visit the Temple of Heaven, a massive outdoor park filled with beautiful green space and temples. In the evening, you will enjoy a wonderful Chinese Kung Fu Show at the Red Theatre. 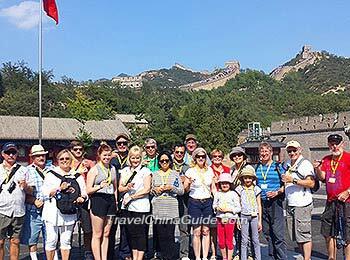 Today's highlight is surely the marvelous Great Wall, which is two hours away from your hotel. The section of Mutianyu Great Wall is one of the best-preserved sections of the wall, surrounded by the breathtaking natural scenery. A round way cable car is included in your trip. As there is no good restaurant close to the wall, we leave the lunch on your own and you may have some fast food nearby with the recommendation of your guide. On the way back to Beijing, you will have a chance to admire the magnificent building of the Olympic Bird's Nest. The tour today will be completed after enjoying some free time at an authentic local market. After breakfast, you will pack your luggage and check out the hotel. On our last day tour in Beijing, we first come to the Summer Palace, the largest and most well-preserved royal park in China. And then have a rickshaw tour along the old Hutong alleys. Chinese Paper Cutting experience is arranged for you to know more about China's popular traditional folk art. The lunch is in a la carte style and you have an allowance of CNY150 per person to order food as you like. Later in the day, we drive you to the airport and see you off for your flight to Xi'an. After two hours flight journey, you will land in Xi'an where your new guide is expecting you with a warm welcome. We transfer you to the hotel. Now comes to our highlight visit in Xi'an, the Terracotta Army, which is regarded as the eighth miracle in the world. 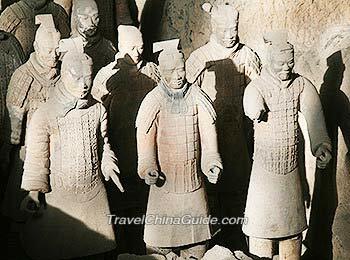 This underground army was built by the first Emperor Qin Shi Huang to protect him in his afterlife. The craftsmanship of the terracotta warriors is outstanding and it is amazing that each warrior has its own attire and expression. After that, we drive back to the downtown city. Lunch today is specially arranged in a local family and the delicious food is made by the hospitable hostess. Visit her house and you will get to know the local people's life in China. Also you will have a chance to learn how to cook Chinese food with the host for free. After lunch, we will visit the Small Wild Goose Pagoda & Xi'an Museum. This evening, the special Dumpling Dinner and Tang Dynasty Music and Dance Show will be scheduled for you. Continue your visit to the ancient City Wall. Before ascending the wall, you will walk around the City Wall Park to experience local people's daily life and also have a chance to practice Tai Chi with the master. If you like to have more fun, why not try cycling on the City Wall? The bike can be rent on the spot at your expense. An a la carte lunch (valued at CNY120.00 per person and included in our price) is arranged for your group at a fancy local restaurant. In the afternoon, you will visit the Provincial History Museum and then come to the Great Mosque. Spend your remaining time at the famous Muslim bazaar, where you can get a good opportunity to shopping small souvenirs or gifts. In the morning, bid farewell to your guide in Xi'an after we transfer you to the airport for your flight to Guilin. The flight takes about two hours. Then you will meet your Guilin local guide at the airport exit after you fetch back your luggage. Not like Beijing and Xi'an where you learn much about China's history and culture, Guilin is a beautiful city in southern part with marvelous landscape. After arrival, we will firstly visit the Reed Flute Cave and the Elephant Trunk Hill, and then transfer to the hotel for a good rest. Today you will enjoy a visual feast with continuous green hills and clear waters when you cruise along Li River from Guilin to Yangshuo. Lunch on the boat is the basic Chinese lunch box so you are suggested to have a big breakfast at the hotel in the morning. 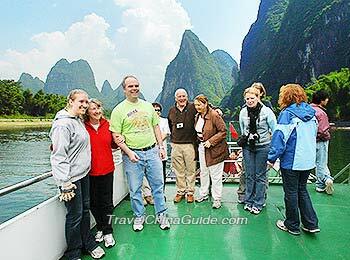 After 4 to 5 hours on the boat, you will disembark at Yangshuo at around 14:00. 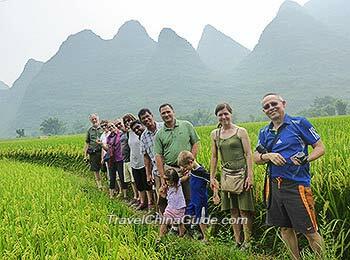 Walk along the famous West Street before having a wonderful countryside trip to appreciate the beautiful rural scenery in Yangshuo. Pay a short visit to a local villager's home. After that, we will transfer you back to Guilin. After breakfast, we transfer you to the airport to take flight to Shanghai. You will be greeted by your local guide upon arrival and escorted to the hotel. Then the rest of the time is free for you to have a rest at the hotel or discover this modern and prosperous city on your own. In the morning, our guide is ready to pick you up after you have breakfast. Today you will visit Shanghai Museum to see more of China's cultural relics. Then visit the Yu Garden which represents the classical private gardens in southern area. The surrounding traditional bazaar is also an interesting place for a visit. An a la carte farewell lunch (valued at CNY120.00 per person and included in our price) will be served at a famed local restaurant. Following the morning activities, you will visit the quiet Former French Concession area. 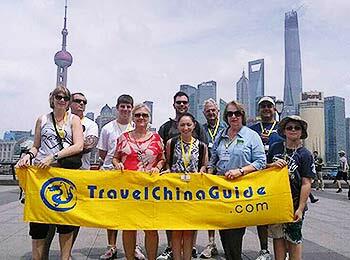 Then come to the Bund, where you will have a one hour cruise tour along the Huangpu River. At the end of the day, our guide will transfer you back to the hotel and bid farewell to you. Today you will travel to the airport for your flight by yourself. You may book a taxi with the hotel reception beforehand. There are two airports in Shanghai. Please check and make sure you get to the correct one that your flight may depart. Wish you a nice journey home! If you would like to stay longer for a private extension trip, please come to your travel consultant to discuss more. 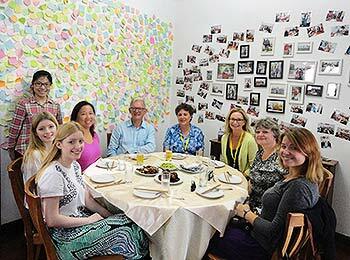 We wish you have had a wonderful time with us in China. Thank you! I hope that when I arrive at Shanghai your guide will have patience to find me and pick me up that is what I worry about now ! We enjoyed the trip tremendously. The sights of the Li River in Guilin were simply breathtaking, and our guide did an excellent job of finding additional activities to keep us busy when we moved through some of the sites faster than he expected. Echo, our guide in Xian, showed us that there were many interesting things to see in addition to the Terracotta Army. She was an extremely good guide and her fondness for Xian and for meeting with travelers from all over the world was evident. The only drawbacks I note are those made by many others. The guides were very hesitant to depart in any way from the schedule, even when we would indicate that we were willing to skip a planned stop to spend additional time at another and that we didn't expect a refund. Second, some of the food were bland and there was far too much of it! 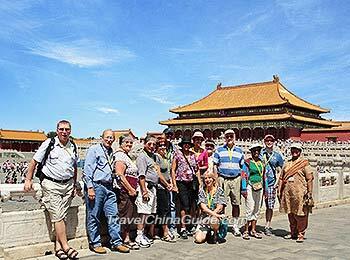 This group tour was very memorable and the Tang Dynasty Dance Show was excellent! Our guide, Carol in Xian, was professional and helpful. We would recommend their services to anyone. We are travellinf from Cebu to Shanghai ( 18-21.04.2019 ) as romanian citizen. Our flight to Germany is on 21.04 from Shanghai. Do we need a visa for Shanghai? You can get free transit in Shanghai. No need to apply for visa. Is Ningbo now included as an eligible exit port for 144 hr visa-free transit on the itinerary Tokyo - Shanghai - Ningbo - Hong Kong - Tokyo? Yes, it is included. In this way, you are eligible for the 144 hours visa free policy. We (Austrian) will fly from Vienna to Shanghai (Nonstop), then have two nights in a Hotel in Shanghai. After that we will embark our cruise ship (Shanghai International Cruise Port) having one night there and will leave the next day in the direction of Japan (a sey day in between). 26th March landing at 730pm. Leaving at 1pm the next day. Flying China eastern airlines, Australia to UK. Layover in Shanghai. Do we need to collect and recheck our bags? I'm planning to stop in Shanghai on my way to Tokyo from Europe. I'd like to know if I can go by train from SH to Suzhou with the 144 hours visa. Yes you can visit cities in the Jiangsu province on the 144 hour transit, though its not a visa but visa waiver. Thank you! Yes , I know, I forgot to write "exemption" after visa! Do you also know if I need to book the train in advance or if I can also book it when I'm there? Generally speaking, you are suggested to book the train tickets online in advance. As I know, TravelChinaGuide.com provides such service. You can ask help for them. If interested, their contact information is booking travelchinaguide.com.